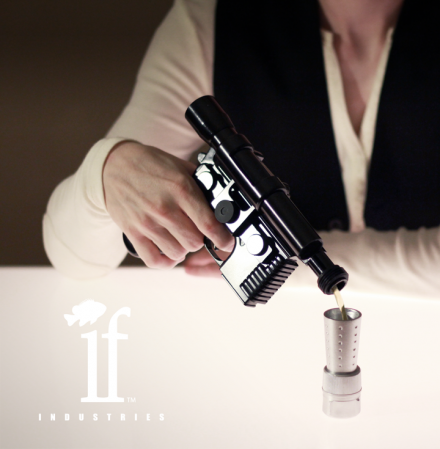 Insignificant Fish Industries has created a 4.4 oz flask called the “First Shot” based on Han Solo’s DL-44 heavy blaster pistol. The silver muzzle is the flask’s cap and unscrews to be a 1.5oz shot glass. As of now, it is an unlicensed product, so it’s technically unavailable, but here’s to hoping it gets the go ahead for actual production sometime down the line. This entry was posted on Monday, November 16th, 2015 at 19:33	and is filed under WTF?. You can follow any responses to this entry through the RSS 2.0 feed. Both comments and pings are currently closed.